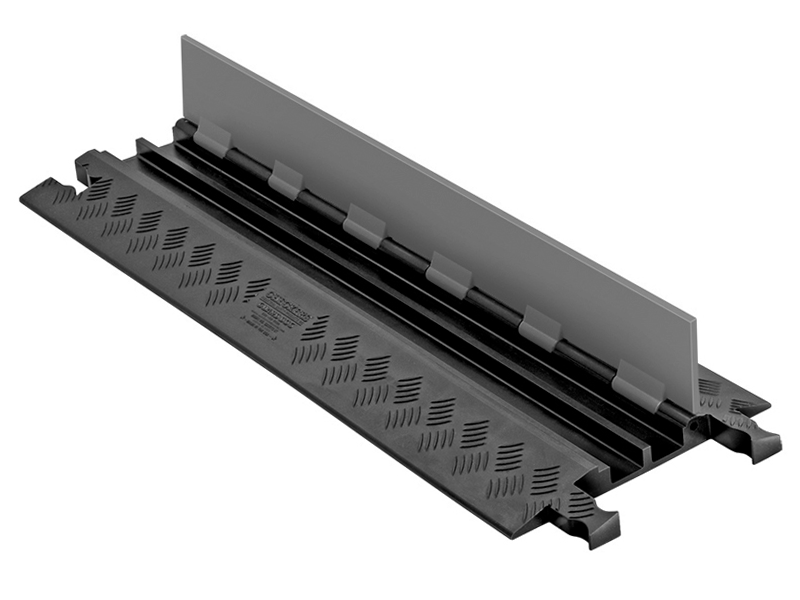 The low profile guard dog cable protectors are manufactured in compliance with the guidelines provided by NEC, OSHA, RoHS, REACH and MUTCD. They are made of high quality and durable material which is treated with UV-stabilizing technology and temperature treatment for providing increased protection to your valuable cables and ensuring the safety of pedestrian and vehicle traffic. According to the American Disability Act of 1990, certain rules and regulations have to be followed for ensuring non-discrimination of handicapped people in public areas such as parks, schools, government buildings etc. Using low profile guard dog cable protectors serves to increase the life of cables and cords while providing a safe crossing to pedestrian and vehicular traffic. Manufactured with MUTCD-recommended colors, these cable protectors are more noticeable from far distances. Exposed cables, cords and hoses present a serious tripping and safety hazard for pedestrians and vehicular traffic, especially if left unattended. The low profile guard dog cord covers are designed and manufactured with high quality, durable polyurethane material. This non-biodegradable material is not affected by extreme temperature conditions. 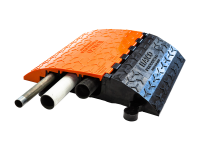 The outside width of 0.75" provides increased security to hoses, lines and cables within. 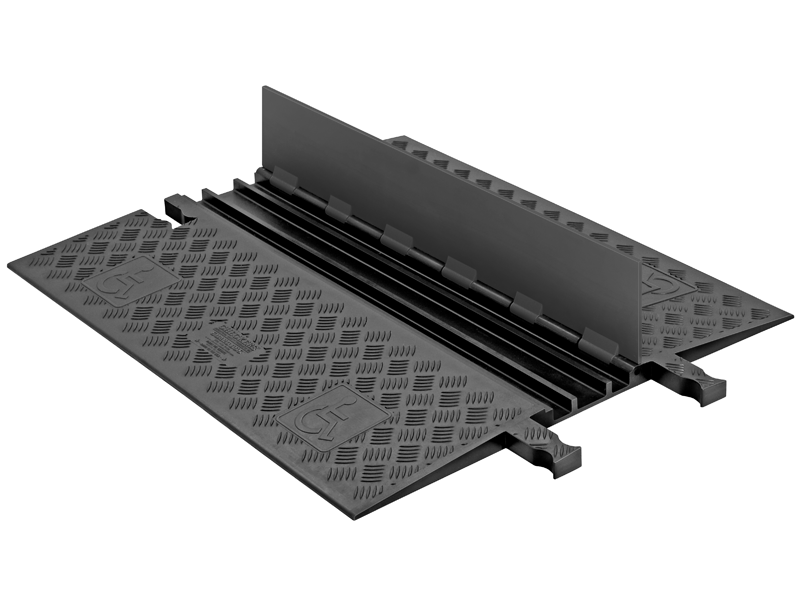 These low profile cable ramps are only 1.25" high from the surface – this makes them a safe crossing point for pedestrians and vehicles. The low height also makes it easier for handicapped people to cross the ramp without requiring support. The threat of tripping or stumbling increases due to bare cables. Dangerous cables can prove to be fatal, if left uncovered. Exposed cables can easily catch fire or they may burn when exposed to high heat or inflammable liquids/solvents. 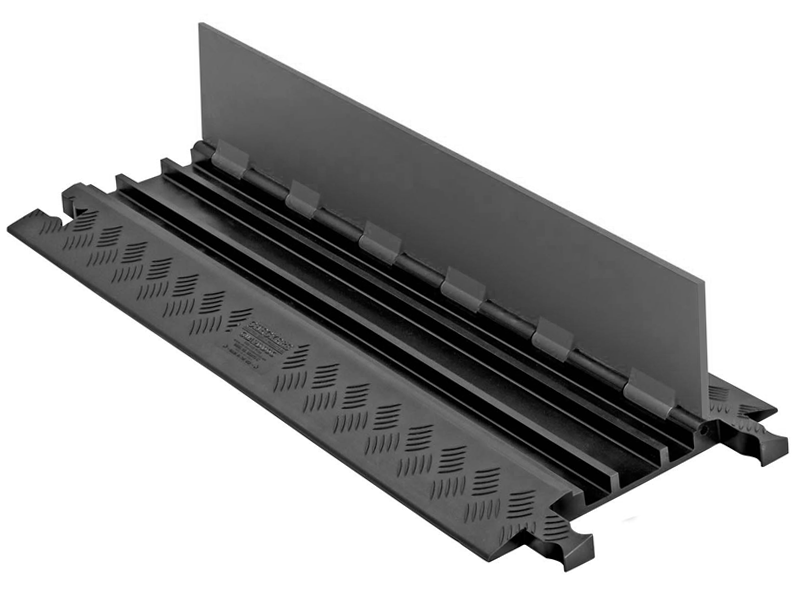 Low profile guard dog cable covers provide adequate protection to people on foot and allow them to notice the upcoming risk. 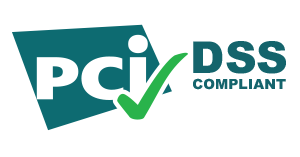 In compliance with NEC, OSHA, RoHS, REACH, and MUTCD, safety symbols are mounted on the lid. 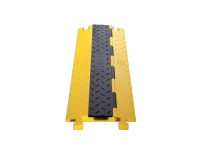 5-bar tread plate surface restricts accumulation of slippery solvents or liquids, thereby reducing chances of slipping, tripping or stumbling. 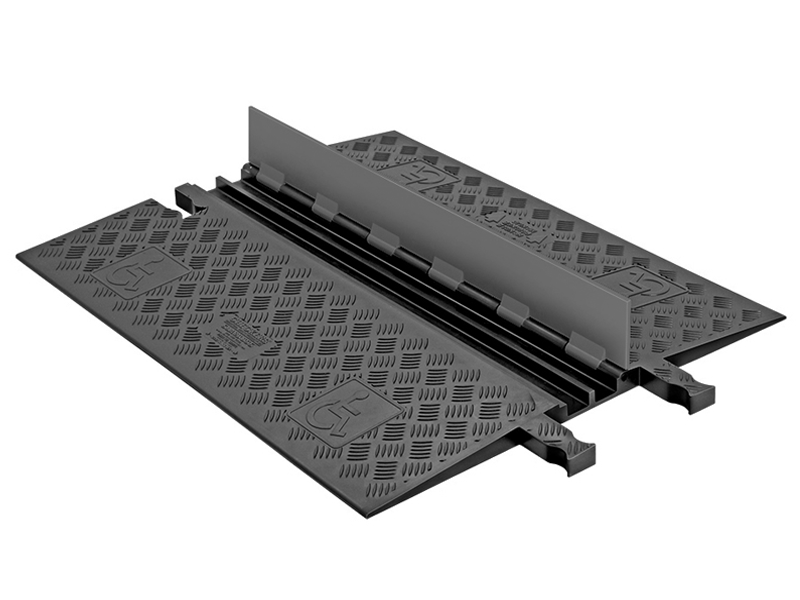 The lid protects valuable cables from external hazards and keeps pedestrians and vehicles safe from cable-related incidents. 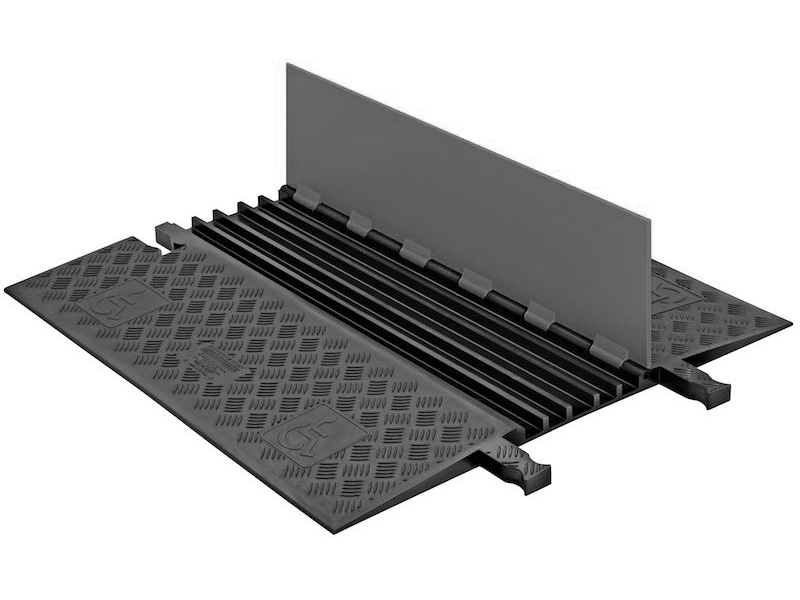 The thick surface does not allow heat to pass through the low profile guard dog cable covers, thereby reducing the chances of fires or damage. High load bearing capacity i.e. 36,000 lb. per tire or 72,000 lb. per axle. With the specialized dog bone connectors, two or more low profile guard dog cable protectors can be connected for increased coverage. These products are temperature and UV-stabilized in compliance with state and federal guidelines. 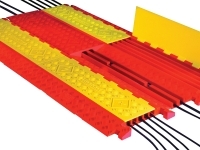 Modular interlocking system makes setup, breakdown, storage and transport easier. 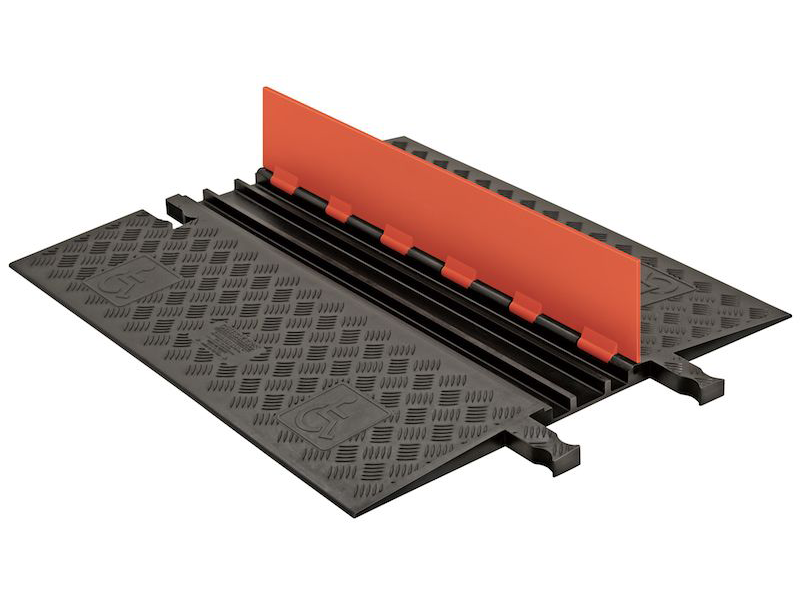 The products meet NEC article 525 requirements for ensuring safety of pedestrians and vehicles. 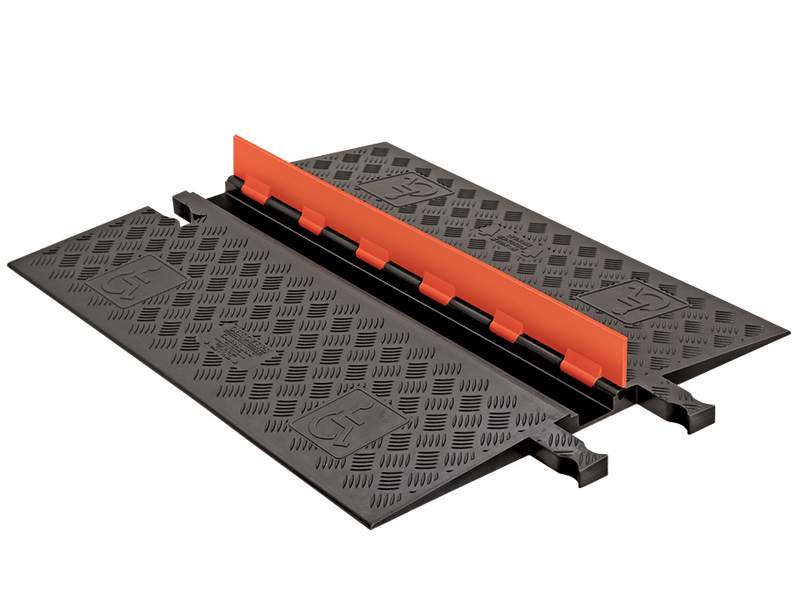 It has a5-bar tread surface for increased balance and reduced tripping or slipping. The ends should always be secured with connectors. Make sure to ask our representative about connectors for your low profile guard dog cable protectors. During installation, only one cable should be inserted in one channel. Over-stocking can lead to sparking or short circuit. Grip tape should be used to keep the lid closed. 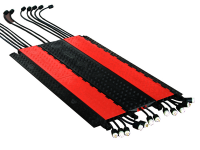 Areas with low vehicle traffic and high pedestrian activity can be regulated using low profile guard dog cord covers. 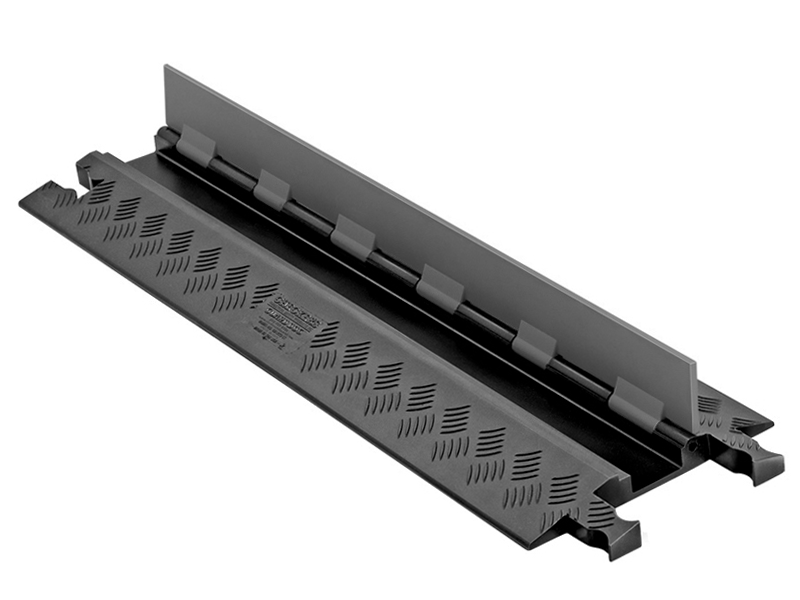 GUARD DOG® LOW PROFILE models are the most compact open hinge top cable protectors on the market. 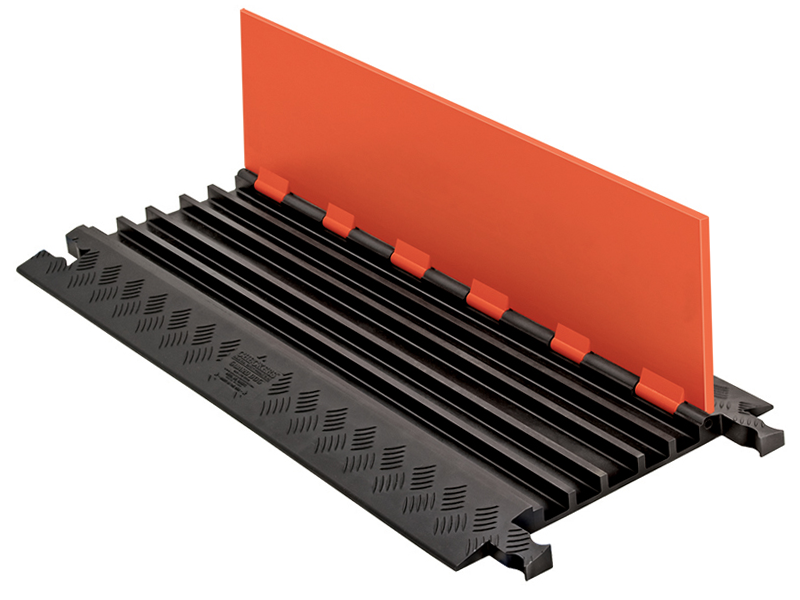 These cable protectors provide a safe and easy crossing for vehicle and pedestrian traffic, while still maintaining a high load-bearing weight capacity for heavy equipment. 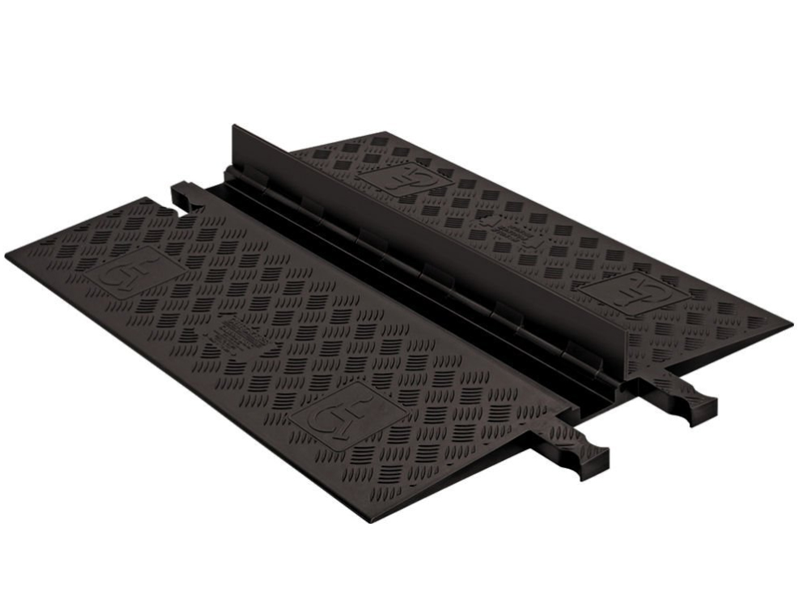 The Low Profile models are available with your choice of standard or ADA/DDA compliant ramps. 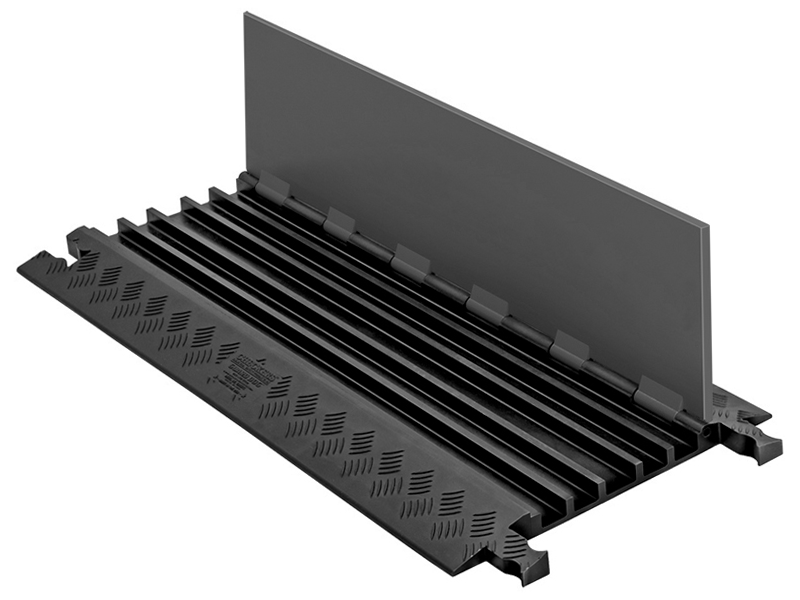 Guard Dog Low Profile heavy duty cable protectors are designed to protect cables and wires from damage for vehicle and pedestrian traffic. The cable protrector surface has a 5-bar tread surface. This Patented designs offers superior traction for reduced slipping. The Modular interlocking style allows for easy setup and dismantling. 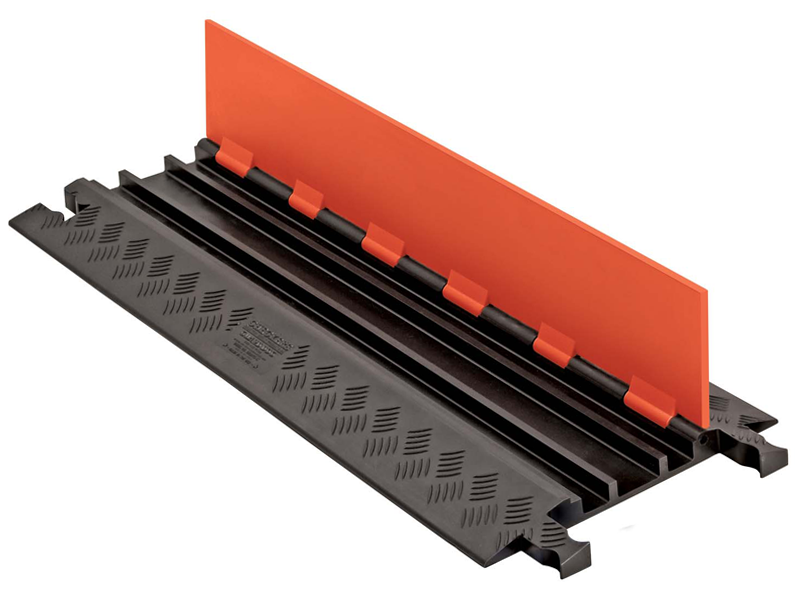 Ideal for all types of applications. Made in the USA.